New month, and thus a new product with reduced price! This month it's about cleaning and get your home sparkling clean! Every week we use multiple detergents for cleaning. Wouldn’t it be nice to buy just one multi-purpose product for the laundry, dishes, floor, and even the bathroom? Forever Living Products has introduced such a product – a liquid detergent that is highly effective and very economical to use. 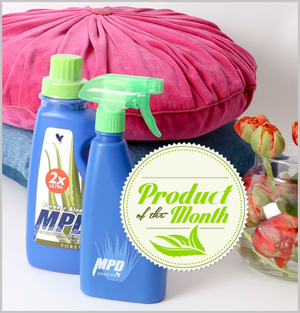 Forever Aloe MPD® is a multi-purpose, liquid concentrated detergent created by FLP - and we’ve just made it better than ever! Our 2X Ultra formula is even more concentrated to take your cleaning that much further. A versatile cleaning product that is ideal for laundry (all types of clothes), it is also a household cleaner for floors, bathrooms, tile and carpet cleaning, and for hand-washing dishes. This safe, concentrated, liquid detergent is great for lifting grime, cutting through grease and removing stains without scratching or marking any surfaces. It is versatile enough to do the job of many similar products on the market, with a major cost savings for the user. If you buy MPD 2x Ultra during May, you get a smart spray bottle to boot. 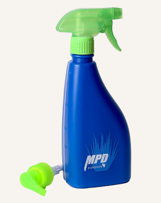 The bottle is specially designed with the same look as the cleaning bottle with a transparent stripe on the side so you easily can see how much detergents you have left.